DOT Net is framework developed by Microsoft that is primarily targeted for Microsoft Windows. In late 90s Microsoft started developing on DOT Net framework. It was originally called as Next Generation Windows Services (NGWS). 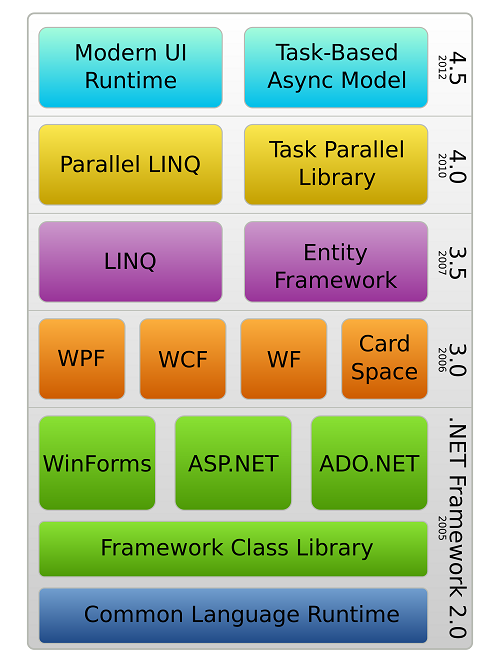 So what are other things related to DOT Net framework History let’s see it further. Built in support of ASP.Net mobile control. Code access security for APS.Net Application. Built in support for Databases. DOT.Net frame work for small devices. IPV6 support. 2 New data service component ADO.Net Entity framework and ADO.Net data service. 2 new assemblis were introduce System.Web.Abstraction and System.Web.Routing which are used for ASP.NET MVC framework. It also include SQL Server 2008 and Visual Studio 2008 service pack 1. Common language runtime version 4. Metro Style App that is used to develop metro app for Windows 8 and Windows phone using WPF and Xamal.